Comments Off on Microsoft Dynamics AX 2012 Coming Soon! Microsoft Dynamics AX 2012 Coming Soon! Microsoft Dynamics AX 2012 was recently introduced at the Microsoft Convergence 2011 in Atlanta. 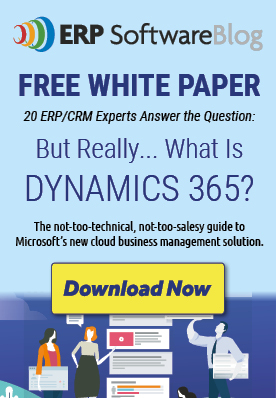 There are quite a few anxiously anticipated new components of Microsoft Dynamics AX 2012. Microsoft Dynamics AX 2012 will contain pre-built capabilities for five industries: manufacturing, distribution, public sector, professional services, and retail. This functionality included directly in the solution offers customers flexibility and it is not something most ERP solutions can deliver. According to Microsoft Technical Fellow, Mike Ehrenberg, “Most industry-specific solutions only cater to that industry,” says Ehrenberg. “Offering five in one answers a real need that customers have to integrate solutions across industries. It gets organizations up and running faster, saves integration costs, and it supports greater accuracy across the application — meaning users get a single version of the truth.” What does this mean? For example, Manufacturers often manage their own distribution and sometimes their own direct retail operations. Other companies have segments of their businesses that operate on a project basis, like services companies. Microsoft Dynamics AX 2012 makes all of this functionality available in a single solution. Microsoft Dynamics AX 2012 is will be available in August 2011 and will deliver a simple, yet powerful, solution. To read more about Microsoft Dynamics AX 2012, click here to read the official Press Release from Convergence. Posted in About Microsoft Dynamics AX, Dynamics ERP for Distribution, Dynamics ERP for Professional Services, Dynamics ERP for Retail | Comments Off on Microsoft Dynamics AX 2012 Coming Soon!